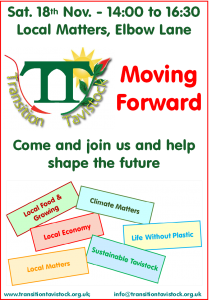 Please get in touch if there are additional matters you would like to add to the agenda. The current committee must stand down at the AGM and may be re-nominated for the coming year. The committee would like to receive nominations from anyone interested in participating in the Committee during 2017/2018. This entry was posted in Uncategorized on November 10, 2017 by Transition Tavistock.